Legendary British rock & roll group The Godfathers were formed in 1985 by brothers Peter Coyne (vocals) & Chris Coyne (bass/vocals) from the ashes of their previous band The Sid Presley Experience. The Godfathers toured extensively & quickly earned a serious reputation for their electrifying brand of primal rock & roll & their incendiary live shows around the world. Forming a recording partnership with famed producer Vic Maile The Godfathers released 4 critically acclaimed, smash hit independent singles on their own Corporate Image label (‘Lonely Man’, ‘This Damn Nation’, ‘I Want Everything’ & ‘Love Is Dead') which alongside a brutal cover of Lennon’s ‘Cold Turkey’ were compiled into their seminal debut album release ‘Hit By Hit’ in ’86 & signing a worldwide deal with Sony/Epic records in ‘87. The Godfathers unleashed the storming rocker ‘Birth School Work Death’ as a single in '87 & scored a US Billboard top 40 hit after massive college radio airplay & heavy MTV rotation. Then the classic ‘Birth School Work Death’ album was released in ’88 (includes the 'hit' anthem title track, & singles ‘Cause I Said So’ & a re-recorded ‘Love Is Dead’) & was celebrated with extensive tours of the UK, Europe & U S A & they cemented their reputation as one of the best live acts of the period. The Godfathers’ mob inspired image, raw lyrics & guitar-driven, edgy rock & roll sound was in direct contrast to the clean, synthesized sounds that mainly dominated the mainstream charts at that time & foreshadowed the Brit-Pop/Rock resurgence of the early 1990’s. 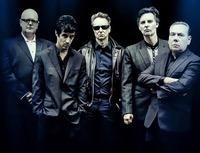 The Godfathers (now featuring Peter Coyne - Lead Vocals; Steve Crittall - Guitar & Vocals; Mauro Venegas - Guitar & Vocals; Tim James - Drums & Vocals & Percussion; Darren Birch - Bass & Vocals) will release their new album 'A Big Bad Beautiful Noise' in February 2017 & then tour the world to celebrate."